OK, flashback. When arcade-game makers jerry-rigged laser-disc videogames in the 80's, there were two basic design philosophies. The first was that the stuff playing back on the disc was the game, and that different segments of video should play back, based on the player's input. This is the design philosophy of the Don Bluth games, such as ''Dragon's Lair'' and Space Ace. The problem there is the unavoidable repetitiveness of that approach -- the scenes in Bluth's game look the same every time and require the same moves. Winning isn't a matter of reaction, strategy, improvisation or reaction so much as it is one of memorization. You get killed by a monster one time, you remember where he pops up next time. The other approach is to superimpose computer graphics on top of video- disc footage. That gives you all the flexibility of the usual videogame, but gets the lush visuals of the video disc. The first games to use this approach put simple airplane-based shoot-em- ups on top of flying footage. The whole was exactly the sum of its parts -- the usual shooting game, with some film running behind it. Flash forward a few years. American Laser Games and other companies combine those ideas with a light-gun, and create games where you shoot at on-screen villains. Super-imposed computer graphics show gunshot blasts or bursts of blood on top of the laser-disc bad guys. For many players, it works. The photorealistic visuals give you an interesting world to interact with (well, shoot at), while the skill of shooting is difficult enough and subject to enough random factors that rote memorization isn't enough. Now that the video can be compressed on to CD-ROMs, these games can be played in the home, with either a light-gun or a joystick-style controller. Is it the same without the gun? Hardly. But it's still reasonably entertaining. 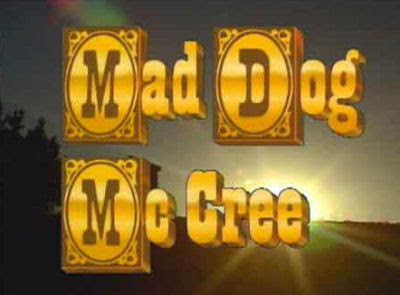 After the ''Mad Dog McCree'' title sequence, the disc asks for your choice of controller: gun, remote controller, trackball, or other. I only have the standard controller included with the Magnavox CDi450 and a pair of touchpads, so I can't evaluate the quality of the gun. The standard controller is barely adequate for this kind of action game, and the touchpad is only so-so. With these controllers, you get an on-screen target that you point at the bad guys. Using the ''speed'' switch on the touchpad offers two speeds: much too slow, and not quite fast enough. Intentionally selecting the wrong kind of controller on the first screen doesn't help. The game opens inside a shack, which holds all your game controls. From this, you can shoot a rulebook to get game help, blast a ''load game'' barrel to restore a saved game from player memory, shoot a bullseye to go out to a practice range, etc. It's a nice interface, straightforward and appropriate to the title. 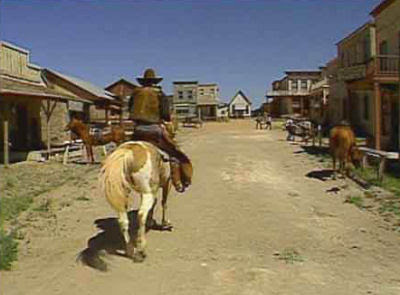 When you hit the ''play game'' wanted poster, you jump to video of riding into a western town, as you'd see it. The entire game is in a first-person perspective, appropriate for a shooting game. An old man calls out to you, and tells you how Mad Dog McCree's gang has taken over the town. 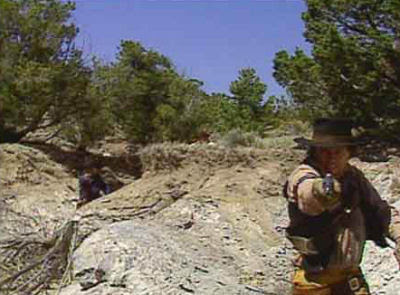 Near the end of his speech, a gunslinger appears behind him and draws. If you fail to shoot him, he'll kill the old timer... and you won't get the man's hints you need to succeed! In scenes where you can shoot, the barrel of your gun is shown at the bottom left of the screen. If you run out of bullets, you must shoot this icon to reload. Suffice to say that you should avoid running out of bullets, but also be careful about when you reload. Once you arrive in the town, a screen allows you to choose which of four locations you'd like to visit first (or return to the game options shack). If you've listened to the tips, you won't visit the Sheriff's Office until you've gotten the keys from the thugs at the Saloon. Both those scenes, as well as some others, play out the same way every time you play them. So, if you know where to shoot once, you should be able to breeze through in later attempts. Other scenes incorporate random elements. For example, once you enter the bank, bad guys can pop up in any number of places, and you'll have to move quickly to shoot them before they shoot you. Of course, there are really only a half-dozen places they can appear from, so taking them out will eventually become a matter of watching for which bad guys haven't yet popped up. If you're shot, you get a visit to the undertaker, who tells you how many lives you have left. You'll also see him, and lose one of your five lives, if you shoot an innocent person or fail to protect the innocent from Mad Dog's gang. After an admonishment to shoot better, you once again get to pick which scene you want to play. Some characters in these scenes give you important information you'll need to progress in the game: where to find a map to Mad Dog's hide-out, where you need to go first, etc. Of course, you may not be able to hear them if you've turned down the TV volume because POW! you don't want to wake up the POW! neighbors. The characters are classic one-dimensional western cliches, closer to ''Back to the Future III''s version of the Old West than ''Unforgiven''s. But since you're going to end up killing most of them, it's a moot point. The whole western setting is nicely realized, with period dress and realistic sets. American Laser Games spent some money here, and thanks to the digital-video cartridge, it shows. Since there's a ''save game'' available, you might think finishing the game is a simple matter of finishing each scene without losing a life, saving the game, playing the next, and restoring the saved game from memory any time you get killed. Not so fast, pardner. The game punishes you for that by making you shoot it out in a duel. You see a bad guy ready to draw, and your bullet-chamber icon is replaced by a holster. When he starts to move, or even just before, click the holster and shoot him. Win and you continue. Miss and you're out one life. One of the duels points out a huge flaw of the game's control scheme. 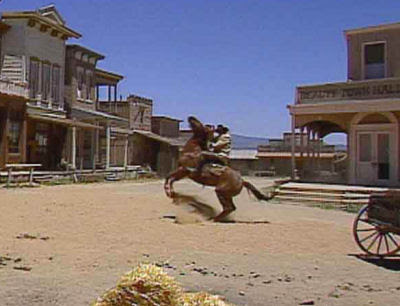 If you see the duel is in front of the corral, you can basically kiss off one life. There is no way to get the cursor to move from the holster all the way across the screen to the duellist before he shoots you. You die not for lack of reflexes or attentiveness, but because you didn't pay $30 extra for the gun, and because CapDisc didn't include any way to speed up the cursor. Escape From CyberCity had a cursor that accelerated as it moved across the screen -- why isn't that at least an option here? 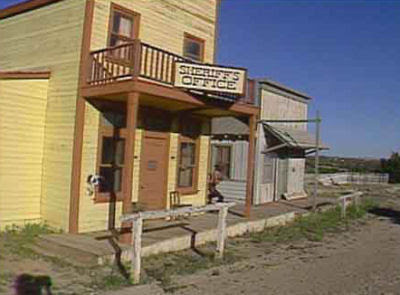 If you finish all the scenes in the town, it's off to find Mad Dog McCree's hide-out. Again, the key is to listen to hints of people you meet along the way, who'll tell you order in which you need to visit scenes to survive. There are some innovative scenes along the way, in which you need to use your gun for purposes other than shooting bad guys. 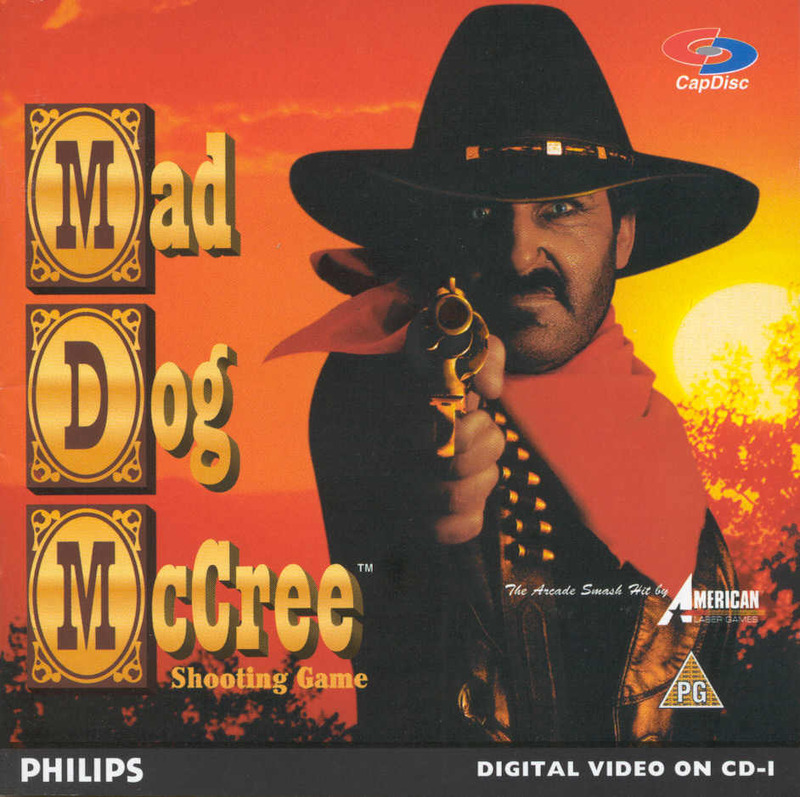 The gameplay in ''Mad Dog McCree'' is a little simple for my tastes, but I think there's an audience for this kind of shooter, and they'll appreciate the variety of shoot-out situations. Philips has announced a few more shooting games are on the way, so those fans may want to consider buying the disc bundled with the light-gun. With just a touchpad, it's a bit more frustrating that it ought to be.